I want to start off by thanking everyone for the immense amount of interest and support that they have shown in the days since publishing my Boston’s Mysterious Vanishing Men blog post. I never expected it to go so viral, and the response has been surreal. I have been contacted in various ways by friends and family of some of the men who’s stories were shared in that post, which was incredibly humbling. That being said, I want to reach out to those loved ones to tell them that if there is anything I have written that they wish me to change or omit, please contact me to do so. I have already been asked to do so and readily obliged. The last thing I want to do is cause more pain for those loved ones. I have NEVER stopped viewing these men as people. They are not just cases or statistics to me. They are individuals with stories, and in researching them for so many hours I have grown attached to them. I have also been sent hundreds of stories of similar cases from across America, some even begging me to investigate. Unfortunately, I am all too aware of these other cases. The reason I chose to focus on Boston was because it is my home, and the place I am familiar with. But I also stuck to Boston because looking into the rest of the cases across the U.S. would probably consume the rest of my life. If you know of similar cases in your hometowns, I urge you to try to make your city safer in ways similar to my plans, which I will discuss shortly. I have been asked a couple of times now what my goals or motives for this investigation are. All I have ever wanted to do is highlight cases that I have found interesting, to call them into question in case justice still needs to be sought, and to stop similar events from occurring in the future. I wanted to raise awareness to keep others safe. But I also want to try to relieve the stigma surrounding young men drinking and dying. For the cases in which that may apply, I want to remind people that everyone makes mistakes in their life. But these men should not have died, and their deaths were preventable. Which leads to my next point: Where do we go from here? My next goal is a multi-step plan to make the city safer. I am working with Someone who is drafting a letter for local bars along the water, asking them for safer and more conscientious business practices when serving alcohol. I will also be contacting several people in power asking for improvements to safety along the harbor. As it stands, the area near Long Wharf where several of the men went missing or were found dead is considerably unsafe. I want the installation of better guardrails, better lighting, more surveillance cameras, and hopefully even the hiring of several night guards trained in water rescue and CPR. If these cases truly come down to men falling in the water, why shouldn’t we be doing everything possible to prevent it? Now, there is the chance that these are not merely coincidences. As many of my readers have postulated, there is a chance that some of these men were killed. I have been overwhelmed by the eagerness to try to get to the bottom of the mystery (encouraging curiosity into the unknown was my intention of this blog!) and by the sleuthing taking place in the comments! I wanted to foster a place where people could discuss freely, so I tried to publish as many of the comments as possible. However, there have been a few which I have not felt comfortable allowing, mostly ones which speculate on personal facts on the individual men. I do not think that such unfounded speculation is helpful at this juncture, and furthermore I don’t want to offend loved ones of these men. The second kind of comment I have not been allowing are ones which try to create a profile of the ‘killer’. While I appreciate the enthusiasm, I do not think this should be attempted by anyone but professionals, nor do I think we have enough info at this time to create a successful profile. My greatest fear is that this will turn into a witch hunt. I do not want to cause a hysteria that will result in hurting innocent people. So please refrain from trying to pin blame on a certain kind of person (uber drivers, truckers, etc.). What needs to happen instead is everyone coming together to make Boston, or their own cities, safer! Everyone needs to use the buddy system. No one should drink to excess. If you feel uneasy, trust your gut. If you see something, say something! If you notice an intoxicated person, get them help! If we maintain vigilance, whatever is happening to these men will stop, one way or another. In the coming weeks there may be petitions to sign and letters to write, so I hope that all of you that have shown such passion for these cases will be there then as well. It is only by working together that we can invoke change, and thanks to all of your sharing and raising awareness, that is now a very real possibility! So thank you again everyone for helping me share these men’s stories. If you were to hear of a young man disappearing after a night of partying and ending up dead in a river, you might be quick to call it a tragic accident. You might think it was common almost, for young foolish drunk men to die in this manner. But why would you think that? One possibility is that you have heard of the sheer number of cases that seem to indicate this scenario. But what if this isn’t what is occurring at all? What if something far more sinister is taking place? The trouble with these cases, the thing that got my attention, is also the very thing that seems to make them so dismissible. They are incredibly predictable. In fact in many cases they are practically cookie cutter. But some are so similar that they seem to go far beyond coincidence. After my obsession with unexplained missing persons cases was sparked by David Paulides (as chronicled in my last post) I couldn’t help but begin to notice them more, and then Dennis Njoroge went missing. I saw flyers posted all around Boston, his eyes following me daily, and my heart fell. I had a bad feeling in my gut as I began to connect him to other cases. I remember telling friends gravely that if the precedent was correct, he would be found dead in the Charles River. One month after he went missing, Dennis was found in the Charles. The Police did not suspect foul play, but very little information has ever been made public (and not for lack of trying let me tell you). I don’t know what happened to Dennis, and maybe the police and his family do. Maybe he was a troubled boy who met a tragic but self inflicted end that cold December night. The fact is I might never know the truth due to the privacy of the family, but regardless, Dennis sparked in me the desire to go back and examine other similar cases in my city. Other cases where the truth seems hard to come by. I decided to begin my own investigation of sorts, and I’m going to use this page to track my findings and hopefully bounce ideas off of others who are interested. Here are the cases I have found so far, showing name, age, and month/year missing. And now I will take a closer look at each of the cases. John Daverio was a beloved 49 year old teacher at Boston University. He was born in Philadelphia, and moved to Boston to get a PhD from BU. He later became the Chairman of the Department of Musicology there in 1987, a position he held until his death. He was considered one of the world’s leading experts on German Romanticism and Robert Schumann, whom he wrote several books about. (Ironically Schumann once attempted suicide by throwing himself into the Rhine river.) John was considered a happy man by all who knew him, and was lovingly caring for his elderly parents, indicating that suicide was unlikely. Daverio was last seen on CCTV leaving the BU campus on the evening of March 16, 2003 at around 8:30pm, wearing a red jacket. He had left his wallet and briefcase behind in the classroom, but was carrying a white bag which was never found. After being missing nearly a month, his body was found in the Charles River on April 14, 2003, near the Cambridge Boathouse. Police did not suspect foul play, but his death has never been explained. Those close to him refused to believe he would commit suicide. Dustin ‘Dusty’ Willis was from Hatteras, North Carolina. He became a PO3/E4 petty officer and Engineer in the Navy and was stationed in Norfolk, Virginia, as a crewman aboard the S.S. Donald Cook. Dustin was a musician, and was married but seperated, with a five year old son. When Dustin was 26 the Donald Cook docked in Boston for Saint Patrick’s Day celebration. On the night of March 16th 2007 there were blizzard conditions in Boston. Dustin was out with his shipmate friends at the Black Rose Pub near Quincy Market. On their way out at around 11pm, Dustin’s shipmates lost sight of him in the storm. Friends state that he was sober at the time. He had spoken with his girlfriend several times that evening, and she confirmed this. When she called his phone the final time that evening a person that was not Dustin answered, and told her that they had found his phone. Dustin’s phone was found at about 1am on the ground near Long Wharf, but there was no sign of Dustin. On March 21st Dustin’s body was found in 22 feet of water off Long Wharf, steps away from where his phone was found. Police surmised that he had simply become disorientated by the blizzard and slipped into the harbor. William Hurley was a Navy sailor from North Carolina. He was stationed in Florida. On a stop in Boston in 2007 he met his girlfriend, and the two began dating. (Ironically he was in Boston the very same night that Dustin Willis went missing.) That December he moved from Florida to Quincy to live with her. William was invited by his friend Brendan Venti to attend a Bruins game at the TD Garden on October 8th 2009. However after only the first period and a couple of beers, he claimed he was tired from work, and was going to have his girlfriend pick him up. William stepped outside and called her, and she headed to pick him up. When she was close by she asked where he was. William asked a passerby who answered “99 Nashua Street”, and warned his girlfriend his phone was about to die. She told him she would be there in a moment and was just around the corner, then William’s phone died. When she got to the location, William wasn’t there. She drove around looking for him and asking people if they had seen him, but it was as if he had vanished into thin air. The search for William Hurley began but little leads were found. At some point his cellphone was found smashed, but Police released few details. David Mark grew up in New York and had a Masters in Geography from the University of Albany. David had Type 1 Diabetes and was insulin dependent, and also had Aspergers. He was 24 when he went missing. On March 2nd 2011 David left the home where he lived with his parents in Albany and drove to Boston, where his sister lived in the Chestnut Hill area. David went and ate at Boston Beer Works near Fenway and had a few drinks. Employees said he was in good spirits. David never showed up at his sister’s house, and never returned home to Albany. The search for him was underway fast, as his parents knew he could Get sick without his insulin. His car was found several days later in Chestnut Hill, at 10 Middlesex Rd. but there was no sign of David. 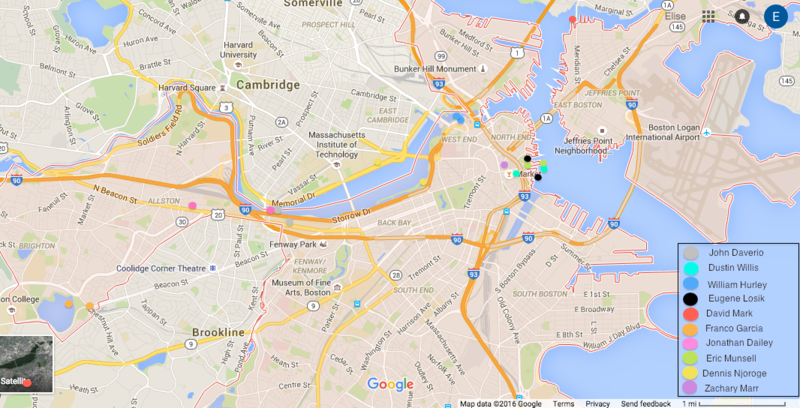 His phone was last pinged at around 6:40 in Boston, near the Charleston Naval Yard. On March 8th a Boston fishing company found David’s body in the Chelsea River, downstream from the Andrew McArdle Bridge, 15 feet from shore. Police said there was no signs of trauma. His cause of death was not made public, but police say it was not foul play. Eric Munsell was born in New Brunswick, New Jersey. He went to Boston University and got a degree in aerospace engineering. He was working as an aviation engineer at General Electric, and was pursuing a Masters in mechanical engineering via the Edison Engineering Program. On February 8th 2014, Eric was celebrating his 24th birthday at the Market Lounge. He was escorted out by a bouncer at about 11:30pm for causing a disturbance on his way to the restroom. It was only 18 degrees out, but according to the bouncer Eric claimed not to have a jacket. A half hour later his phone was pinged heading toward the Harbor and not his North End apartment. He was caught on CCTV near the Marriott Long Wharf. On April 23 at about 12:30pm Eric’s body was found in the water at the end of Long Wharf. Police did not find his death suspicious. Why he supposedly walked to Long Wharf then proceeded to fall into the water and drown is unexplained. Josue Quispe-Almendro was a runner, a photographer, and a religious young man. He lived in Malden with his tight knit family and was just 18 when he went missing. Josue was out running errands with his brother on October 17th 2015. He dropped his sibling off at a Bed Bath and Beyond in Somerville at about 4:30pm. He failed to return home or answer his phone. His car was found then next day at 10pm in Quincy. Josue’s body was found washed up on Saquish Beach in Plymouth on November 12th. The cause of death was not released but police said foul play was not suspected. How Josue got all the way to Plymouth is unknown. Zachary Marr (UPDATED) grew up in Leominster (not Harvard, as is often reported) MA. He was celebrating his 22nd birthday with his cousins at the Bell in Hand Tavern on February 13th 2016. At about 1:30 he went outside for a cigarette, leaving his coat behind. At 1:40 he sent a snapchat to his cousin Amanda Marr that said “They won’t let me back in, lets leave”. She agreed to come out. However when they got outside Zach was gone. According to CCTV and bouncer statements, Zach never asked to come back inside. He was caught on CCTV at 1:44 walking past Boston Public Market, heading in the direction of TD Garden and Zakim Bridge. Police later found CCTV footage of Zachary “entering” the water under the Zakim (this footage has not been released). It is unclear what that meant precisely, but teams immediately began to search the water in the area. Nothing was found, possibly due to extremely low visibility. Several more searches were conducted with similar results in that area of the Charles River. On March 15th 2016 at about 5:45pm passerby’s noticed a body in the water by the Museum of Science Boston and (ironically) the Leverett Circle State Police Barracks. It was Zachary. His body was found in a location consistent with previous searches. Why he left the Bell in Hand and walked about a mile to the Charles is still unknown. I made a visualization of where the victims were last seen vs where their bodies were found. I think its particularly beneficial to take a closer look in the financial district. The proximities of these establishments is incredible. Furthermore, many of the the victims are related in other ways. William Hurley, Dustin Willis, and Jonathan Dailey were all from North Carolina. Willis and Hurley were both in the Navy. Willis, Gene Losik, and Eric Munsell were all engineers. Franco Garcia was studying chemistry. Garcia, Willis, Dailey, and John Daverio were all musically talented. Josue Quispe was a photographer and Dennis Njoroge was a filmmaker. Furthermore some cases seem bizarrely linked. Dustin Willis was a NC native who joined the Navy and was in Boston March 16 2007. William Hurley was a NC born Navy man who was in Boston that same night, and would disappear two years after Willis. Both were talking on the phone to their girlfriends seconds before vanishing. Both men’s phones were later found. Eric Munsell was removed from a bar on his birthday without his coat, possibly told a bouncer that he didn’t have one, and vanished into the night. Zachary Marr walked out of a bar without a coat two years later on his birthday, and told his friends that he wasn’t being allowed back inside. Both were later caught on CCTV. I can’t claim to know just now what any of this might mean. all I can do is present the puzzle pieces that we currently have, but I know we are still missing far too many. What I am certain of is that something terrible is happening to people all over the country, maybe the world, and the Boston cases are only a small sampling of it. I hope that someday this mystery can be solved to prevent future deaths, and pain for their families. Until then I urge everyone to make sure that YOU are not the next victim. Do not go out alone. Do not go near the water alone. And if possible, avoid wearing the color red. It’s a color that shows up often in David Paulides’ missing persons cases, and William Hurley and John Daverio were both wearing it when they vanished.